Beaducation: The Blog: Rock Out!!!! Riveted Rock Band Online Class and Gary Wilson Beads on Sale. Rock Out!!!! 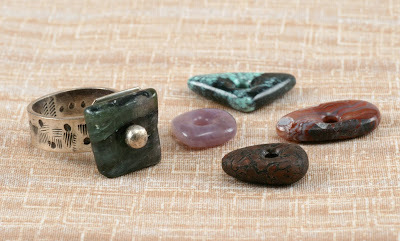 Riveted Rock Band Online Class and Gary Wilson Beads on Sale. This ring really rocks! We think this sale rocks quite a bit, too. Kriss Silva's Riveted Rock Band Online Class is 20% off now through October 1, and those super special hand-cut beads from Gary Wilson are 40% off. A Kriss Silva original design and a perfect example of her unique jewelry style, her online class,"Riveted Rock Band", incorporates one-of-a-kind beads from lapidary artist Gary Wilson to create a perfect work of art to wear for your finger. One of Kriss' originals and a sample of Gary's beads. We had a quick chat with Kriss and asked her to share some thoughts on this class. So Kriss, What was your design inspiration for this project? Gary Wilson's Beads, of course, I had to find a way to use these beautiful beads. What are your favorite words to stamp on this ring? Punk Rock themes seem to be on the top 10; groupie, back stage pass, punk rock girl, rocker chic, rock princess, girls rock, etc, you get the message. What makes the Gary Wilson beads so perfect for this project? First of all, they are one of a kind, just as the ring should be. Second, Gary drills the beads with extra large holes, which is important when riveting any bead (so they don't break). Also, Gary gives me the stone of my choosing in whatever shape I want. Which really helps when you have a certain design in mind, it needs to be just right! We think this design is just right, too. Now is your chance to unleash your inner jewelry rock star and make a couple for yourself (or as gifts.) This class is perfect for the wire worker looking for a new challenge. Jump over to check 'em out now and ROCK ON!!! !